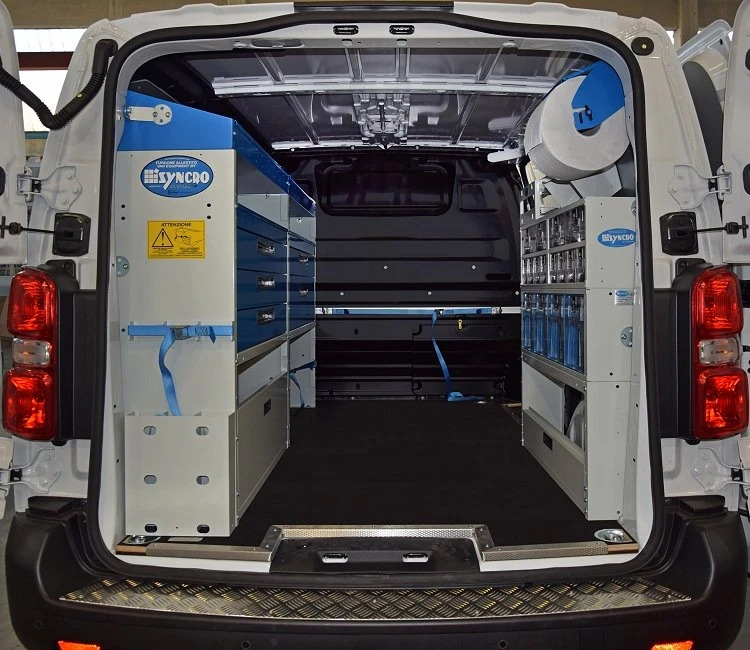 Discover how Syncro System’s van racking specialists transformed a Toyota ProAce into a superb mobile workshop for a plant service engineer. Toyota’s ProAce is a medium van along the same lines as the Peugeot Expert and Citroen Jumpy. The first series came out in 1994 but the ProAce has been renewed twice since then, in 2007 and in 2016. Over the years and for all three generations, the ProAce has maintained its reputation as a medium van with practical design and good load capacity. It has therefore remained a favourite with users in search of a commercial vehicle that it neither too big nor too small. 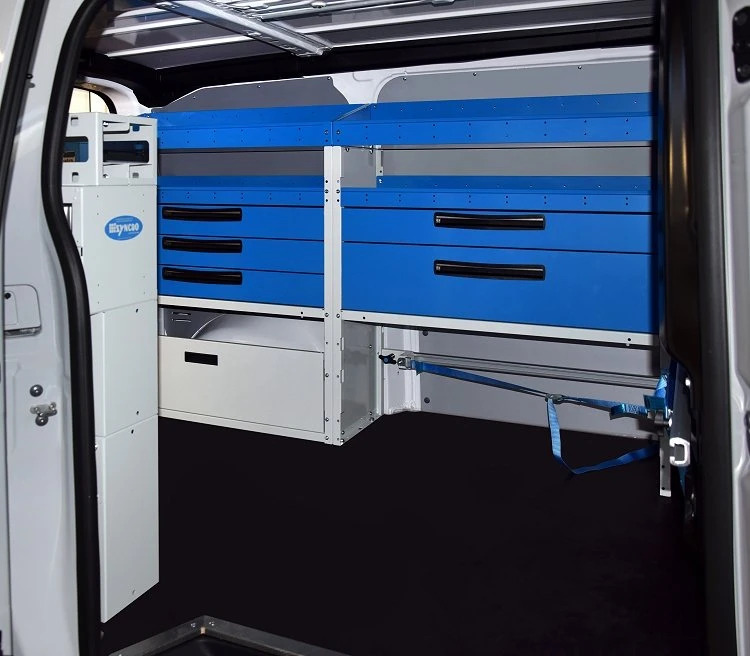 The load compartment is quite square in shape, which makes it ideal for carrying cargo and for installing the racking systems needed to convert the van into a workshop on wheels. The user of this vehicle specialises in industrial plant maintenance and needs a nippy and practical van to get to his customers quickly and to install and service their plant. His van also has to carry a large amount of equipment, tools and spares in a safe and orderly manner. The first thing the Syncro team did was install internal body liners. Like all vans, the ProAce comes without real protection against shifting cargo, leaving is bodywork susceptible to serious damage. The Syncro team fitted a floor liner in 12 mm thick resin-coated plywood, complete with metal edging and recessed cups for the original floor anchors. The internal walls and doors were then covered with protective liners made from galvanised and painted steel sheet, laser-cut to ensure a perfect match for the van’s bodywork. When the interior of the van was properly protected, the Syncro team moved on to installing the racking as such. At the bottom of the left side we find two wheel arch cabinets. That over the wheel arch itself is fitted with a fully opening, lift-and-rotate door while that nearer the cab contains a rail and strap for securing the user’s tool cases inside the van. 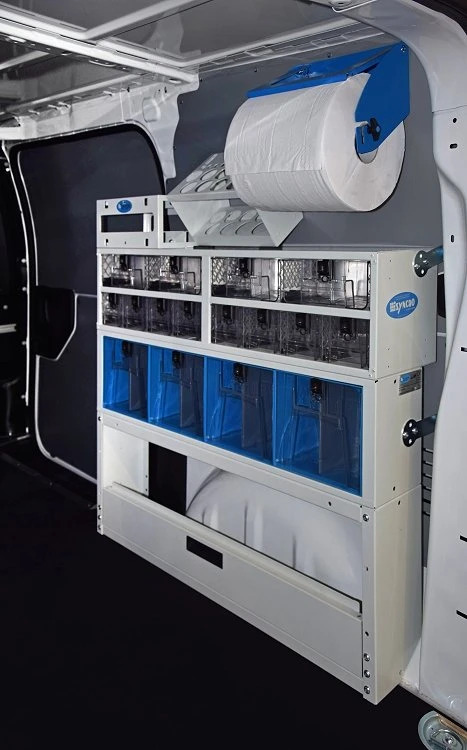 Further up are five large metal drawers mounted on telescopic runners, all complete with space dividers, non-slip mats and an automatic system for keeping them shut. The left side racking is topped off with four shelves, these too with mats and dividers. Moving over to the right, the racking consists of a wheel arch cabinet with a lift-and-rotate door, a cabinet with four tilting transparent containers and another cabinet containing a total of twelve pull-out transparent containers. Customers appreciate both varieties of Syncro’s transparent containers, tilting and pull-out, for their extremely practical and robust design. Practical because they let you see immediately what’s inside and because they are fitted with an automatic locking button. Robust because of their metal cabinet and the use of PMMA, the virtually indestructible material used to make windows for aeroplanes and submarines! The owner of this ProAce also decided to install a number of accessories to help improve his productivity. On the left we can see a rack and strap for transporting long items. The bulkhead has been fitted with a rail and strap for securing cargo. Over the right side are two aluminium spray can holders, a practical silicone cartridge rack and a 270 mm paper roll holder. 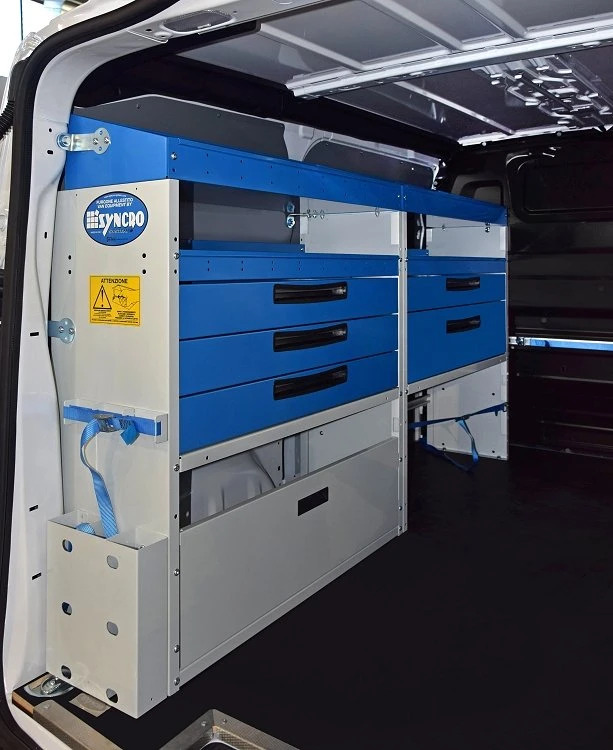 This racking project gave both the customer and the Syncro team good cause for satisfaction, as it transformed the vehicle from a simple van into a mobile workshop capable of providing an efficient and safe solution to the user’s working needs!